I found them while traveling the back roads of Vermont! The perfect socks to wear with crocs! What!? Socks with Crocs? Already posted about that here and the vote is against it especially from my daughters but that hasn't stopped me. When I found these socks I knew I had a solution. 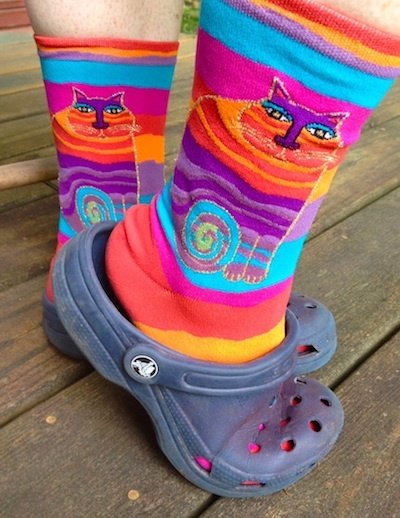 What else but brilliantly colored Laurel Burch socks to go with crocs? Note those crocs. I wore them while I was spay painting my Dancing Red Sticks so they now have a spray coating of red. I think I need new crocs - and that they should be hot pink!